The components in this setup consist of a TV, a standard NTSC VCR, a Home Theater in-a-box, a Game such as Sony Playstation, a Audio/Video switch (Radio Shack, Wal-Mart) and a digital satellite receiver. 1) You want to watch television provided by the satellite TV receiver. 2) You want to watch DVDs from the Home Theater in-a-box. 3) You want to be able to record a TV show from the satellite receiver on the VCR. 4) You want to be able to play a game on the SONY Playstation. 5) You want to be able to play a VHS tape. 6) You want to be able to listen to the AM/FM tuner in the HTIB. The home theater in-a-box has at least one A/V Input. could be provided by the SAT TV digital satellite receiver. The VCR and the TV have RF inputs and outputs and RCA composite A/V inputs and outputs. The audio/video switch has at least 2 inputs and one output. Five sets RCA A/V composite (3) cables. The satellite TV provides the receiver for TV shows and is connected to the VCR so TV shows can be recorded on VHS tape. 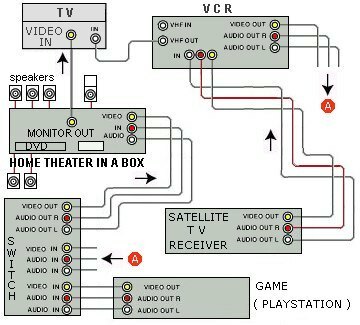 If the satellite receiver has a RF OUT, you could connect a coax cable to the VCR VHF INPUT so that the VCR would not have to be powered on while watching TV. Select LINE 1 INPUT on the VCR to get satellite TV which will be passed thru to the TV which will need to be set to channel 3 or 4. To play a VHS tape, you can select on the TV either channel 3 or 4 or you can select the VIDEO LINE INPUT to use the HTIB. Select the proper LINE INPUT on the A/V switch to select the VCR. Record TV on the VCR. Select a channel on the satellite tuner. If the program is High-Definition you cannot record the High-Def signal on a standard NTSC VCR or standard NTSC DVD recorder. However, the satellite tuner will convert the signal and output to the lower resolution jacks such as composite video. Connect a RCA composite video cable and two analog audio cables (red and white) from the tuner's outputs to the VCR's line inputs. Yellow to yellow, red to red and white to white. By connecting these analog audio and video cables from the receiver all the way thru to the TV, you can record to the VCR and watch on the TV. You must select the proper LINE INPUT on the VCR and the TV. Watch DVD-Video or listen to CD using Home Theater. The good thing about a HTIB with a DVD player is you only need to connect the loudspeakers and the TV which are usually already connected. Set the TV on VIDEO LINE INPUT. To listen to a CD, all you need is the HTIB. Select the GAME INPUT on the A/V switch. Select VIDEO LINE INPUT on the TV. The VCR must be set to accept the input from the SAT receiver. Select LINE 1 (L1) input. Switch the A/V switch to the input for the VCR to output audio/video to the Home theater. Select with the Home Theater remote control, the A/V input in order to send the video to the TV. Switch the A/V switch to the input for the GAME to output audio/video to the Home theater. Select the DVD or the AM/FM tuner on the Home Theater to watch and listen to those sources. To play a VHS tape on the VCR and watch on the TV, you could switch the TV to channel 3. Set the TV to VIDEO input to accept the Home Theater Monitor output. Columbia ISA Audio Video - Empowering consumers thru information.